I love running. I don't really have a runners body, I'm flat footed & I pronate, but I absolutely love to run. Long distance - 10k's and above. It seems like I can solve all of the worlds problems (and any of my own) along with relieve stress while on these runs. But that came to a screeching halt. I thought my days of running were over. I pinched a nerve in my back & I injured my knee. I hung up my running shoes and looked for something else to do to stay fit. 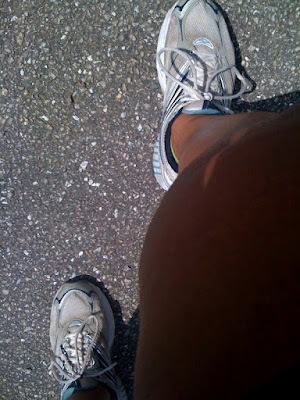 I started taking Bikram Yoga and after a year of practice, realizing the ability to bend my knees and back in directions formerly unheard of without pain, I pulled the running shoes out and hit the road. I had lost my rhythm; my stride. My breathing was off. My lung capacity was good, but the breathing technique you use in Bikram was not working for me. But I kept at it because...well...I could. I even managed to finish a 10K with BK (well, she finished first) ; however that was short lived as that nerve/back issue flared back with a vengeance and I stopped running for another month (or so). I started feeling better again and started back running. It just seemed so hard. I wasn't making the progress that I wanted, I wasn't able to really put in any distance and thought I was gonna have to bail out of the Army 10 miler. My mother, who has never run a day in her life, was doing some research on Marine Corps Boot Camp since my classmates (Joe Pollhein) son is now at Parris Island. She came across a bunch of Marine Corp Running Cadences and suggested that I try running to cadence again. I also downloaded a bunch of US Army Cadences off of iTunes. Put in a search for running cadences in iTunes and you will come up with some really good US Army Infantry, Ranger, Airborne Cadence albums. I synced up and hit the road. OMG! I was a running maniac again. My pace was finally consistent. My breathing was once again on a 3:2 ratio...I could sing along. Now you have to get over the odd looks you may get as your running along chanting "1, 2, 3, 4...Run a little, run a little, run a little more, Hey!" but it works. "Here we go...all the way...everyday...."